6 David again gathered all the chosen men of Israel, thirty thousand. 2 David and all the people with him set out and went from Baale-judah, to bring up from there the ark of God, which is called by the name of the Lord of hosts who is enthroned on the cherubim. 3 They carried the ark of God on a new cart, and brought it out of the house of Abinadab, which was on the hill. Uzzah and Ahio, the sons of Abinadab, were driving the new cart 4 with the ark of God; and Ahio went in front of the ark. 5 David and all the house of Israel were dancing before the Lord with all their might, with songs and lyres and harps and tambourines and castanets and cymbals. 12b So David went and brought up the ark of God from the house of Obed-edom to the city of David with rejoicing; 13 and when those who bore the ark of the Lord had gone six paces, he sacrificed an ox and a fatling. 14 David danced before the Lord with all his might; David was girded with a linen ephod. 15 So David and all the house of Israel brought up the ark of the Lord with shouting, and with the sound of the trumpet. If you’ve seen Raiders of the Lost Ark, you know that you must handle it with great care. Terrible things happen when you don’t show proper reverence, or you handle it with malevolent purposes (as in Raiders). It’s possible that Stephen Spielberg was inspired by reading from this passage of 2 Samuel 6. The “scary” part of the passage, of course, has been excised by the lectionary creators. It’s not very worshipful to hear how God got peeved with Uzzah, when Uzzah reached out to try and steady the ark. He meant well, but God didn’t take kindly to the help, and struck him dead. Apparently, David got a bit skittish about bringing the Ark any further. While he wanted to bring the Ark, which represented the presence of God, into the city, cementing his role as king over the entirety of Israel, he decided to leave the Ark at the home of Obed-Edom. There it sat until David got enough courage to bring it the rest of the way to Jerusalem, so he could set it up in its new home—the Tabernacle. It’s always good to remember that Solomon, not David, gets to build the Temple, so during David’s reign it sat in a tent. The reading from 2 Samuel is divided into two sections. Section one is the initial attempt to retrieve the Ark, so it can be set in the city. The Ark had been lost during a battle with the Philistines during the reign of Saul. Apparently, the Philistines decided that the Ark caused more trouble than it was worth, so they let Israel have it back. Now, it could be placed in an appropriate place in David’s capital. At least that’s what David hoped would happen, when he went out with 30,000 soldiers to retrieve and transport the Ark to Jerusalem. Unfortunately, as noted above, the first attempt went badly—cue Raiders. The second section tells the story of David’s decision to go and retrieve the Ark from the home of Obed-Edom. After all, during this intervening period when the Ark rested at there, Obed-Edom and his family were being blessed (that part is excised as well). When David hears this news, he decides he needed he bring the Ark in the city, so he could be blessed. This time David took more precautions so that nothing could go wrong during the transport of the Ark. There would be no ox-cart this time. Instead it would be carried to the city. The procession would include sacrifices, dancing, trumpets, and shouts of praise. David not only accompanied the Ark, it appears he the dances as the train of people made their way to the city. And all went well. David and the Ark arrived in the city. They safely placed the Ark in its new home—a tent that David erected. Everyone went home. Now blessings could flow David’s way. Everyone in the city seemed to be excited. Restoring national treasures is something to celebrate. David was happy. He had his Ark. Perhaps God was happy. But when he returned home, he discovered that not everyone was happy with the recent events. David was met at the door by his wife Michal, who was the daughter of Saul. She was scandalized by David’s dancing, believing he had revealed to much of himself before his “servant’s maids.” The thought is that the linen ephod, which was similar to what the priests wore, that David was wearing left very little to the imagination. Again, the lectionary selection ends before we get the full story. and that he may have exposed himself to the populace. That embarrassed his wife, who was also daughter of Saul. Once they were in love, but time had passed. David had added to has harem. Michal was put off to the side. She gets a bad rap. After all, David was simply dancing before the Lord. But maybe we’ve been too harsh. Maybe Michal has a right to be concerned. The story goes on beyond what is set for this Sunday’s reading. Perhaps Michal needs our support. After all, her family is gone. She has been largely abandoned by her husband, whom she loved, but perhaps with an unrequited love. We usually give David a pass on his behavior. Yes, he could be a bit boorish, but he was close to God. Unfortunately, too many of those close to him, including Michal, suffered. The reason this passage is chosen for inclusion in the lectionary is that it celebrates God’s presence among the people. The Ark symbolizes this presence, which brings blessing to homes and cities. David had reason to be exuberant in his joy, but perhaps he didn’t consider the feelings of everyone involved. To David, the Ark had been placed in its appropriate spot. It gave him legitimacy and the city legitimacy. It was a sign of unification of a loosely connected community. David had religious motives, but political ones as well. As we ponder the text it might be worth considering which of these two motives held the greatest sway in his life. Granted in the ancient world church and state were more thoroughly integrated than today, but still, was David more influenced by his relationship with God or by his search for power. That question then gets posed to us. Are we Christians first or Americans first? As we ponder this passage, we might think about the symbols that speak to us. Which symbols do we consider sacred? The Communion Table and its elements are possible signs of God’s presence in Jesus. The cross can be a sign. The question is, when push comes to shove do we put greater emphasis on these sacred signs or on alternative signs like the American flag? One further note, it might be worth noting that while the creators of the lectionary have omitted the section detailing how Uzzah gets zapped by God, we would be wise to make clear that such a vision of God is not healthy. If, as at least some of us Christians proclaim, God is love, then surely this act is not representative of God. That is not to say that we need to so soften God’s image that anger and wrath are no longer part of God’s personality is wise, it’s just that we need to be careful in how we depict God, because such depictions can influence our own actions. Passages like this seem so distant from our lives. Yet, they are expressions of human experience. David was happy. His people were happy. They celebrated the presence of God. The question as always comes down to motive. We might rather explore a passage from the Gospels, but let us not forget that even passages like this can speak. It might even serve as an invitation to dance before the Lord (with all due modesty taken into consideration). Picture attribution: Salviati, Francesco, 1510-1563. 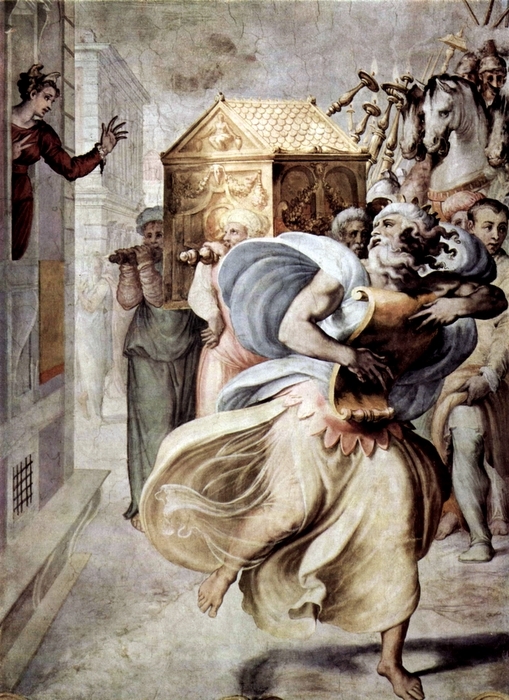 David with Ark of the Covenant, from Art in the Christian Tradition, a project of the Vanderbilt Divinity Library, Nashville, TN. http://diglib.library.vanderbilt.edu/act-imagelink.pl?RC=47899 [retrieved July 9, 2018]. Original source: http://www.yorckproject.de.